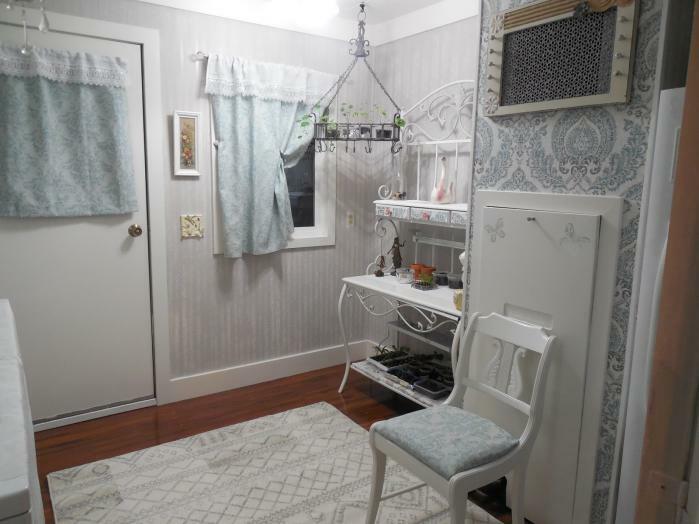 The Diva Farmer’s mobile home makeover is amazing! 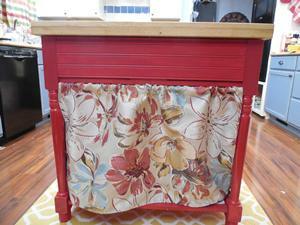 Whether it’s a yard sale find or a complete mobile home, Tina Nichols creates pretty things. 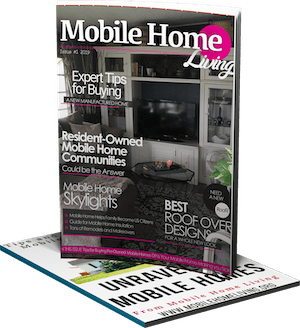 Her mobile home makeover is a great example of the potential that older mobile and manufactured homes have when a talented owner gets ahold of it. 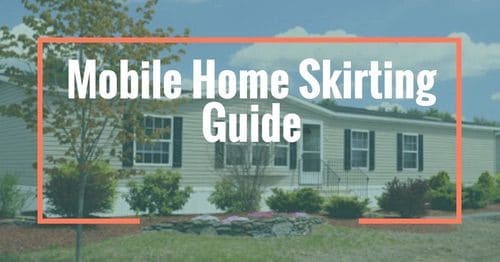 Get ready for an amazing mobile home makeover! After a 6 year career in the military, Tina was ready to own a home. She wanted her new home to have three things: be a smaller cottage-style home with a fireplace, large kitchen, and outdoor space large enough for a garden and some fruit trees. Unfortunately, in today’s real estate market ‘reasonably priced’ means one of two things: rundown and needing major renovations or a compact cookie cutter town house. Neither appealed to Tina. Tina had just about given up on her search for a home when she finally stumbled upon a gated mobile home community with a 1979 Fleetwood double wide that had everything on her short list and then some. The home has a comfortable 1,744 square feet of living space, a fireplace (which had been converted to a pellet stove), a nicely sized kitchen (with a built-in Bosch oven and microwave), and plenty of yard for a small garden and a couple of fruit trees. Tina bought the property with cash and began her mobile home makeover and her blog, The Diva Farmer. She has big plans for both and if the blog ends up like the home, we are all in for a treat! Tina managed a mobile home makeover that transitioned the late seventies model mobile home into a modern cottage masterpiece. Remodeling her own home was a labor of love! 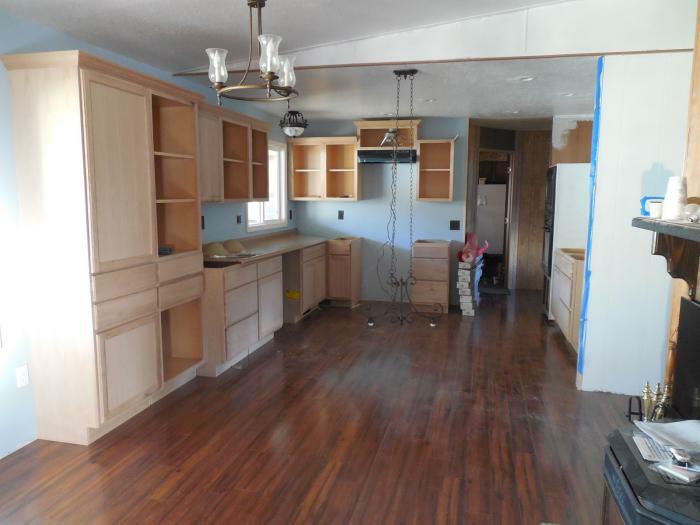 Tina managed the entire mobile home makeover by herself, only using a contractor to help demo and hang the cabinets. 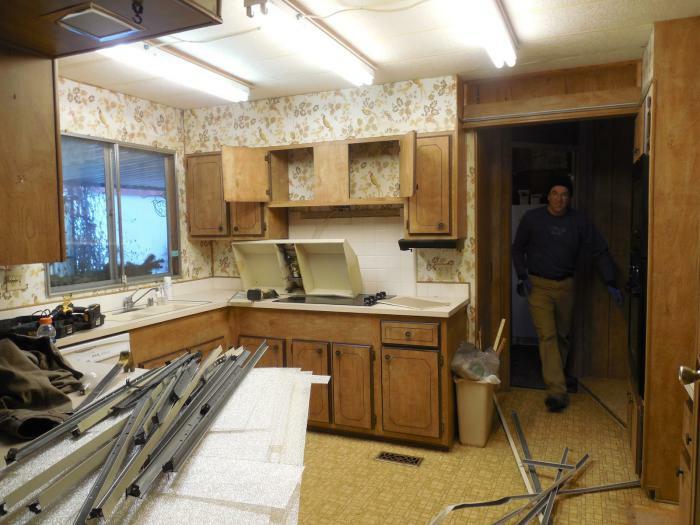 Demolition day is usually the most physically intensive part of a mobile home makeover. It’s always smart to have extra man-power. 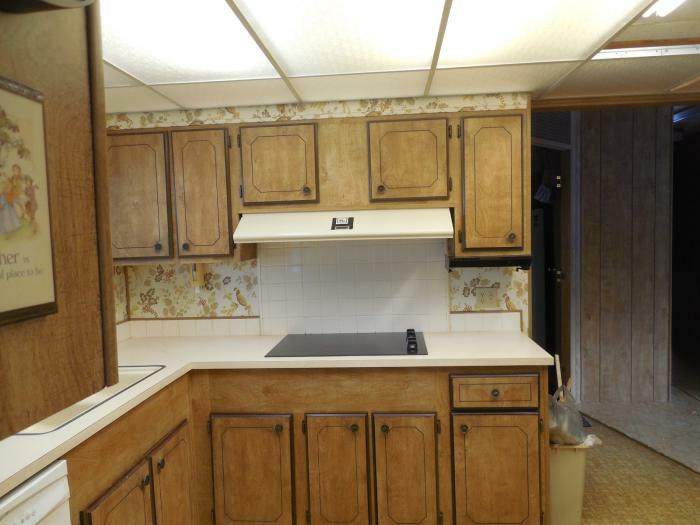 Mobile home kitchen remodels can pose a few complications. 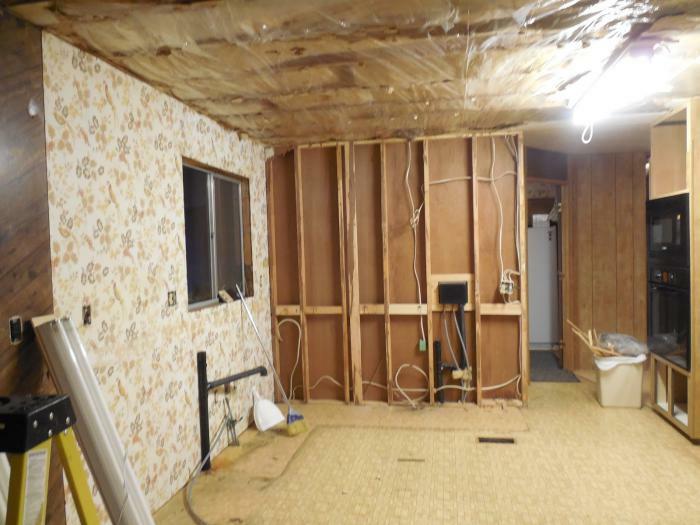 Water lines, gas or propane lines, and heavy cabinetry are all issues that owners have to deal with during demolition. 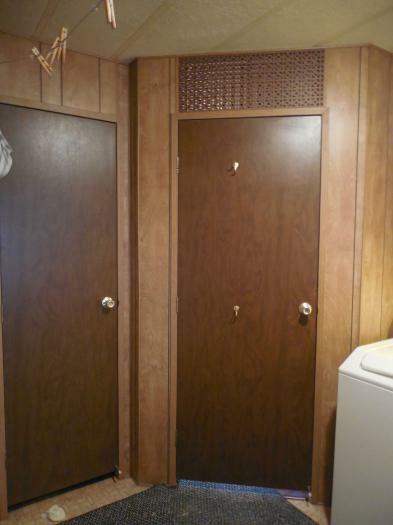 In this case, Tina had to remove the entire ceiling in addition to the cabinetry, flooring, and paneling. After the demolition was finished the rebuilding began. 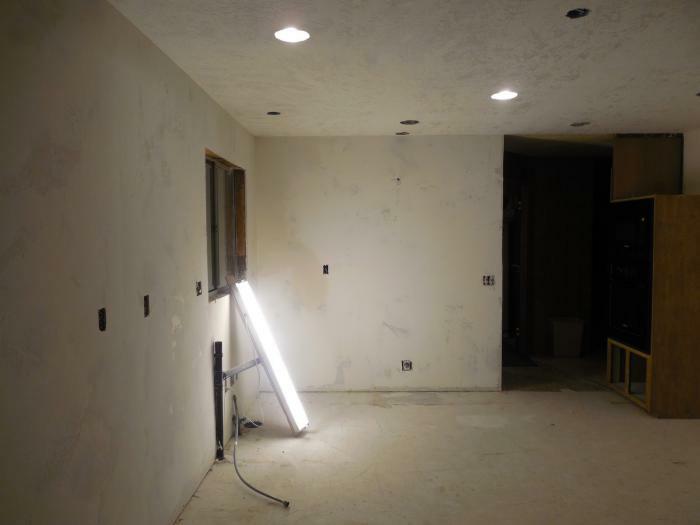 Tina installed sheet rock over the ceiling and walls to give the kitchen a clean canvas to build upon. The floor was also prepared for new covering. Cannister lights were strategically placed to provide good task lighting for Tina’s favorite hobbies: baking and cooking. The sheet rock was finished too. The ceiling was painted a bright white to allow light to bounce around. The walls were painted a light blue and the flooring was laid. Once the paint was dry the new cabinets and lighting was hung. Tina extended the cabinetry into the dining area. Finally, the cabinetry was painted, the countertop was installed, and tile back splash was started. 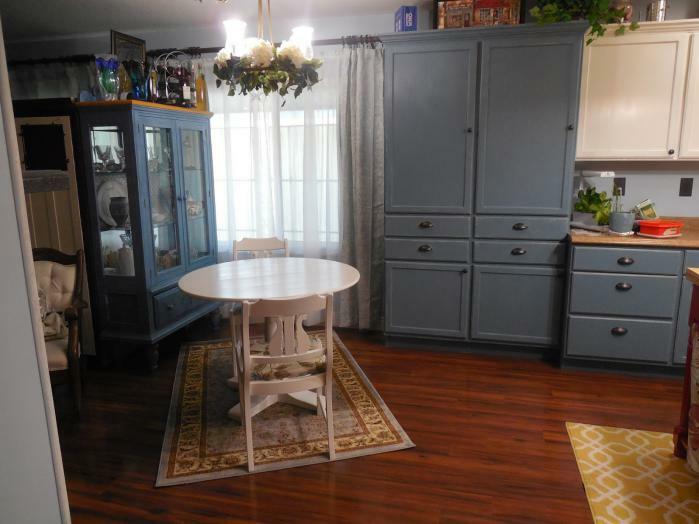 This is a gorgeous mobile home makeover! 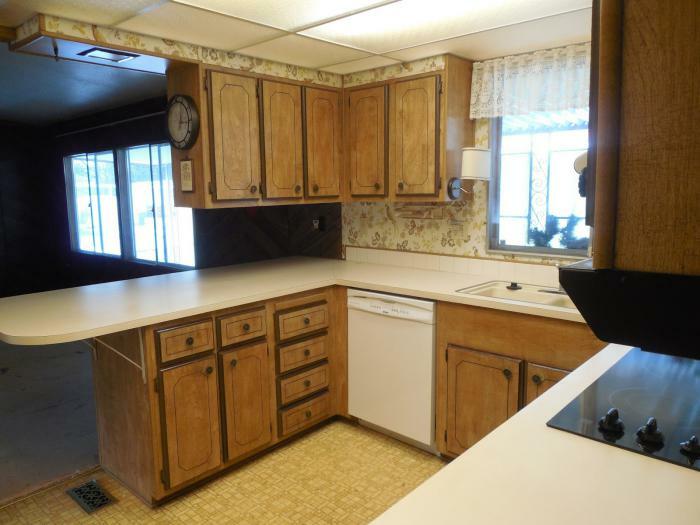 See more about Tina’s great mobile home makeover here. 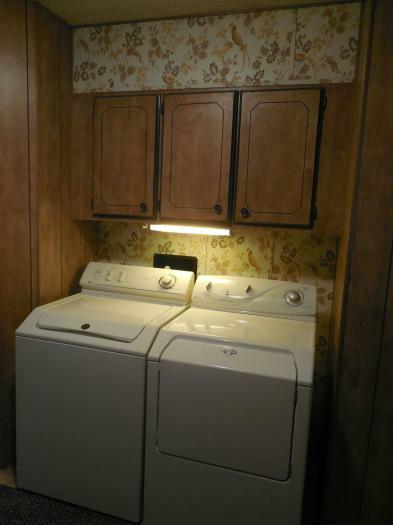 In addition to the kitchen, Tina updated her laundry room, too. 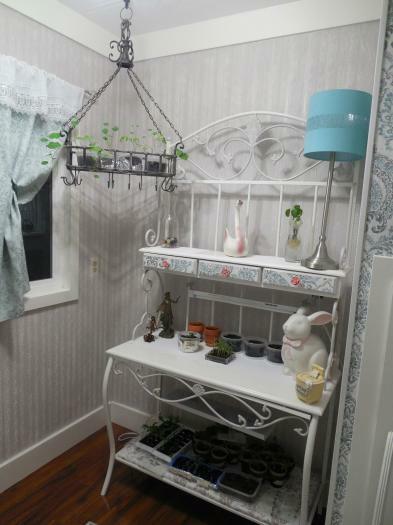 The end result of Tina’s laundry room is awesome! The white surfaces in the laundry room creates a great cottage feel. 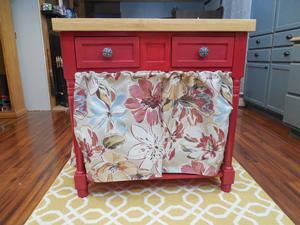 See more of Tina’s laundry room makeover here. 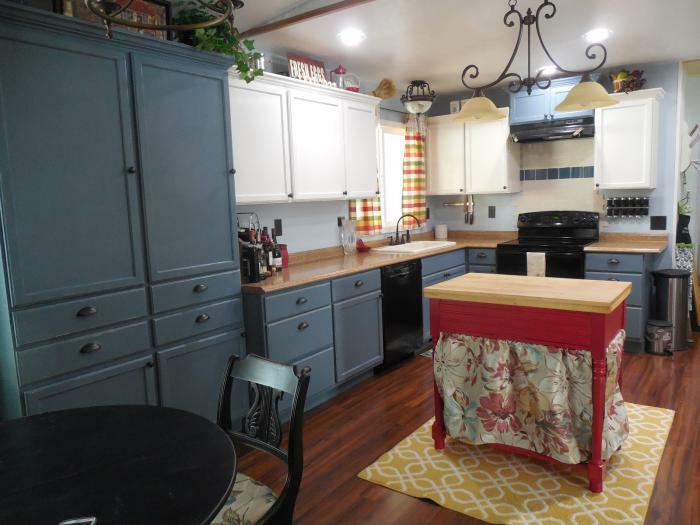 Tina added a contrasting color into the kitchen by placing a red butcher block island in the middle of the kitchen. It was a yard sale find! You can see all the steps of Tina’s yard sale find the update here. 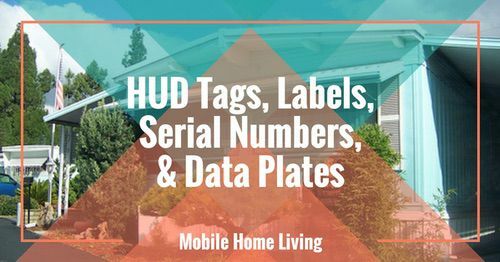 I asked Tina to share some of her best tips and advice for mobile home makeovers. She was quick to say that homeowners should not push themselves with an unreasonable time-frame. 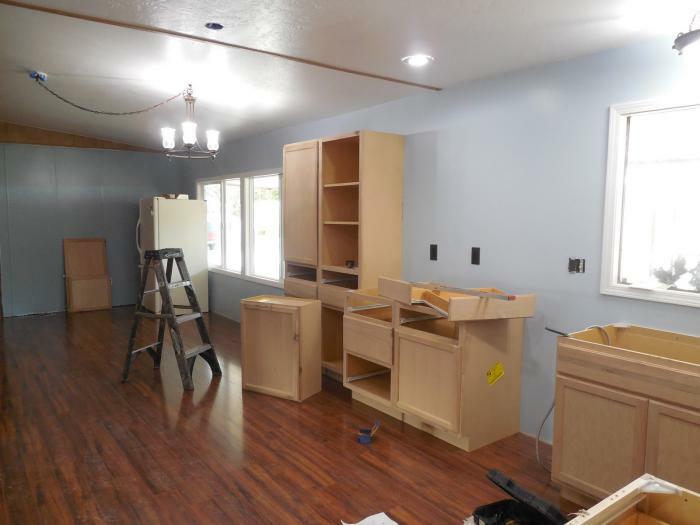 Mobile home makeovers take time! Tina had been living in her kitchen remodeling chaos for one year. That in itself is mentally draining, but pushing herself physically day after day to work on the remodel left her exhausted. She has since learned to pick one small area, focus on that till it is done, and then move on. 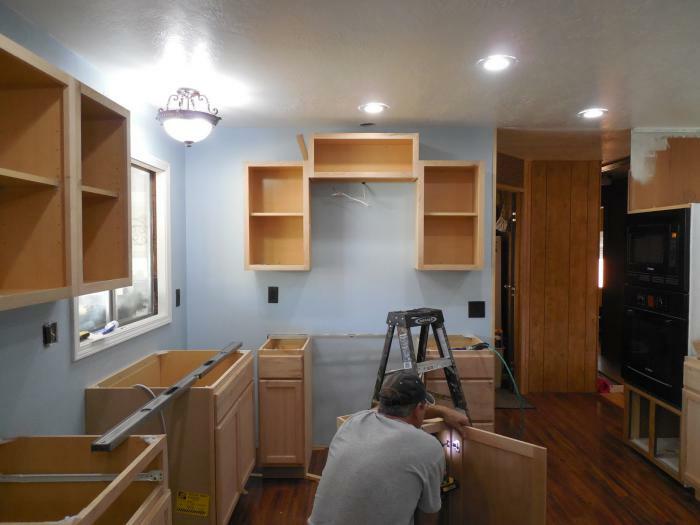 Mobile home remodeling is not a race! Give Me Something to Believe In…. It’s tough to explain to some people that you are going to buy an 30 year old mobile home and remodel it into a beautiful home. Some people simply doesn’t have the creativity to envision such a thing and Tina dealt with that. 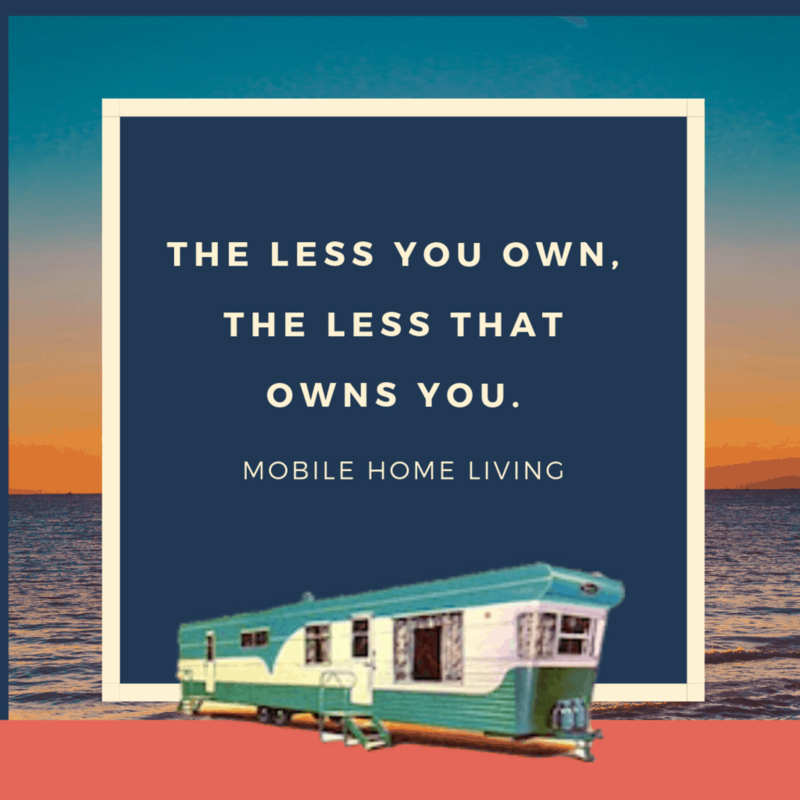 Why did you chose to live in a mobile or manufactured home? I grew up in one and have always had a soft spot for them. I cannot see spending the money on a site built house when I can turn a $24K home into my dream home and then be debt free. Any advice you would give someone thinking about buying a mobile home? 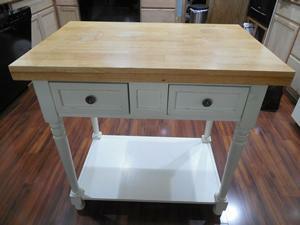 Get past the outdated ugly; it can all be modernized. You want to focus on the layout, the flow from room to room and see if your dream house is hiding somewhere in that layout. Next, make sure it is structurally sound and has minimal damage. 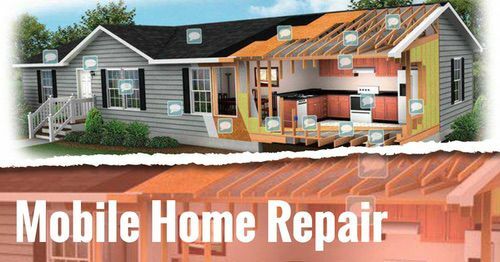 Ugly can be fixed but real damage indicates you may have a major headache on your hands. Have you been stereotyped or dealt with misinformation about your home? How did you deal with it? I live in an area of the country where ‘trailers’ are for the poor. Co-workers were stunned that I bought a “trailer”, they still joke about it. True, there are a lot of trailer parks around here that are dumps, but I happen to live in a lovely gated community and I simply reply to the rude comments by asking them if they are debt free; because I am. I then invite them over and watch their jaws drop when they see the transformed rooms! Any other remarks, advice, information, tips you’d like to share? My son always said I could turn the ugliest house into the most beautiful place to live and that is what I’m doing with The Cottage. You can live in luxury and still have money in the bank and be debt free; just follow your own path. Thank you so much for sharing your gorgeous home with us, Tina! I cannot wait to see what you do with the rest of it! And thank you so much for reading Mobile and Manufactured Home Living! I’m in the process of buying an old (but well maintained) double wide & everyone thinks I’m crazy. It’s on 6 acres that are unbelievably beautiful that I couldn’t afford otherwise. 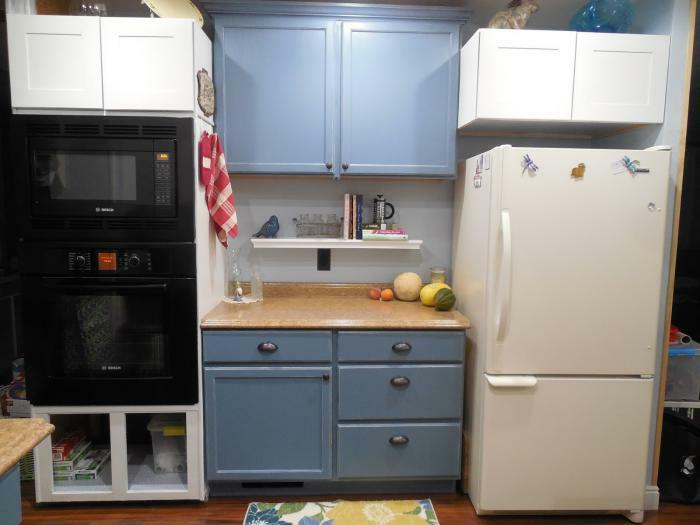 This remodel is totally inspirational. It’s absolutely gorgeous. Thank you so much for sharing! Congratulations Melinda! Follow your heart and your gut! There’s so many possibilities once you own land – you could live in the mobile home while building a home or just turn the mobile home into a gorgeous modern home. The land will likely always gain value, too! Best of luck! Be sure to take lots of images of your process -I’d love to feature it someday! Thanks for another example of wonderful mobile home living. I get so tired of “friends” sniping at me and my little trailer, but then I remind myself I was able to retire ten years early, and am not dependent on anyone else to help pay my bills. I bought mine in a spectacular location, grandfathered in, where new McMansion homes were not permitted to be built. I got a fabulous deal on it because snobs were turned off by the singlewide, and my taxes remain very low because of the trailer.. Truly, there’s so much that can be done with “good bones” and imagination, and you still come out way ahead on the money end. It’s always heartening to get a newsletter from Crystal and Company on days when others have been rude. 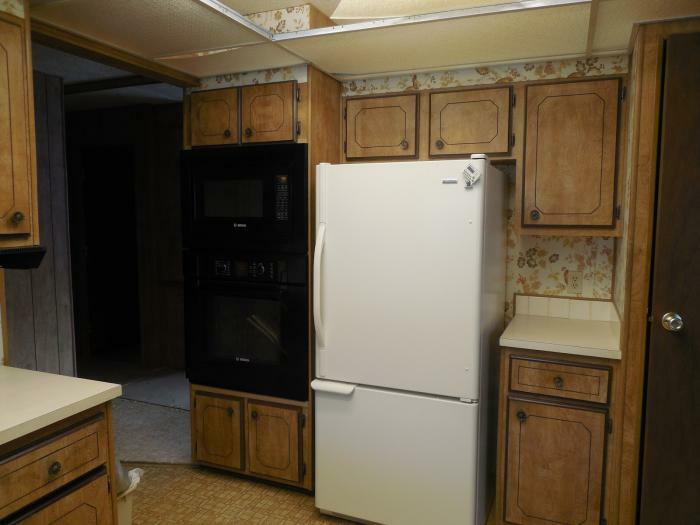 Oh my goodness, I just love Manufactured Home Living! It is just awesome! My husband and I have 8 adult kids between us and now we have adopted 2 from Africa. They need a LOT of time and attention and I would love to just stay home with them and teach them. So, we are considering selling our home, paying off all debt, and buying a double wide. We have found a few at a lake…tiny yards but not a lot of maintenance! 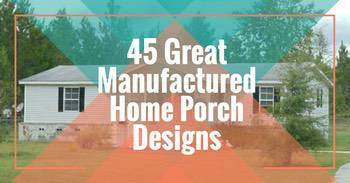 I have a lot of ideas about remodeling a home and you have just given me so many more! Thank you so much!!! Thanks so much! I hope you get the life you want – affordable housing sure does make it a little easier to reach those goals! Please keep me informed – I’ll keep my fingers crossed for you! Best of luck! We’re selling the beautiful home we built many years ago and moving over 300 miles away and into a 2000 model manufactured home. Husband’s retiring and we’re moving to a place with a LOT of property , beautiful view, and close to sons and their families. I have loved seeing all your posts and was wondering if you could show us many more manufactured home remodels, especially adding on kitchens / family rooms. We love our new home and it was well made but the kitchen is a postage stamp size and inefficient for the big family & friend gatherings we love to host. We’re planning on gutting the kitchen and adding a whole new kitchen / family room that will also allow us to enjoy even more of our view. Thank-you ! Congratulations! Sounds like you are going to have a beautiful home! I am completely dependent on the generosity of homeowners. If they send in their projects I always try to get them up on the site (within 60 days or so). Here are all the kitchen articles on the site, there’s over 200 articles so you should be able to find some great inspiration! Best of luck and please take lots of photos so I can share your project! Thank you! Thank-you ! I will take a lot of pics . Meanwhile , I’ll be browsing the link you sent . Hi Tina! I definitely can relate! 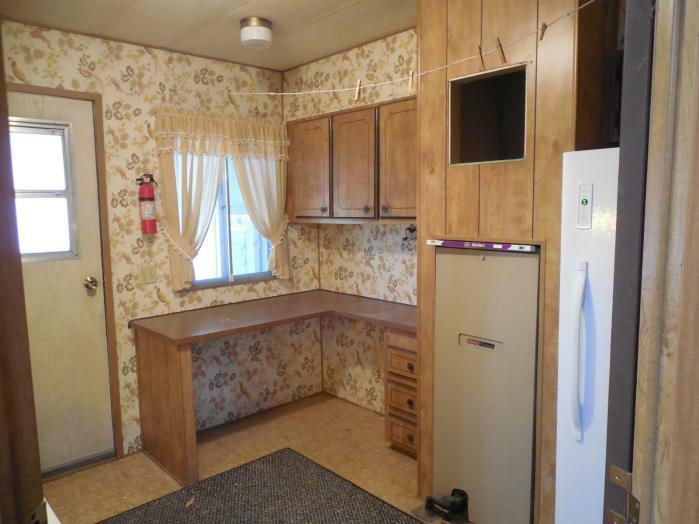 Family members thought we were crazy when we bought a old mobile home that needed a lot of work! I love to see what other people are doing with their mobile homes and maybe this could be the beginning of a trend! lol! You have done a wonderful job! Thanks for sharing! Stunning home and wonderful advice! 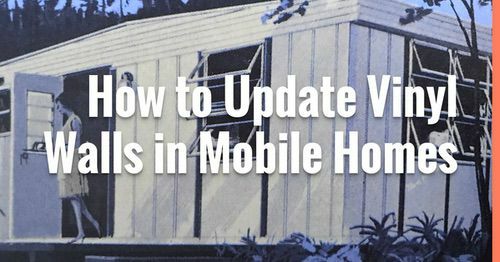 “Ugly can be fixed”, lol…love that quote as it pertains to mobile homes–and it’s so true! What a beautiful home! I also love the comeback of being debt free when people ask about living in a trailer. What a wonderful transformation! Dave and I sat here and checked out all of the familiar Fleetwood details (ours is an ’86 double-wide). Just like Tina, we had our refrigerator in the dining room during the remodel. Tina, you’ve done a spectacular job! Can’t wait to see what you do to the rest of the MANSION! Wow Tina, this is just beautiful!!!! You’ve achieved a lovely cottage style well. I know what you mean about the “Trailer” moniker and stigma. My own 88 yr. old mother still refers to my HOME as “the trailer”. Oh well. 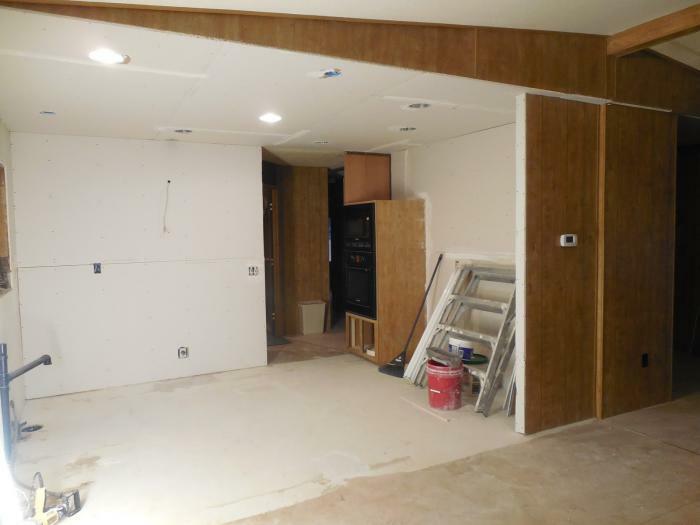 We began with remodeling the interior of our own home and are about 75% finished. I will only spend money that I actually have, and will NOT borrow. We’d hoped to upgrade the exterior this year, but that will have to wait. From the outside, our home looks like the 1975 single wide that it is. The inside however, has been (mostly) upgraded to a more modern ‘cottage’ style, and has become our comfortable and eye pleasing home. We have no mortgage, and the only debt is a small amount left on a car loan. I sometimes look at ‘McMansions’ with a young family of 4 or so, and mom and dad are working their butts off with no time for family, just to pay that huge mortgage and keep up with the Jones’, and I think….why? Good for you, Tina…..you’ve done a spectacular job!